We arrived to a beaming Albert who had a plate of Jamón and a bottle of 2016 Autòcton Blanc in hand. A quick snack and a glass of wine later, we took a little walk through his incredible old vine Sumoll, an indigenous red variety that is undergoing a real revival. Albert makes some of the best with his Gran Autòcton Vinyes Velles. After twenty minutes the wine was gone and so was the Jamón. Fortunately, lunch beckoned. In the corner of the kitchen was a large fireplace in which Albert had slow-roasted some local onions and artichokes. These were utterly delicious, seasoned with salt and lots of Albert’s own olive oil. This was followed by a delicious Catalan stew of Lamb and potatoes. Of course, there were plenty of wines to taste. My favourite was a bottle of 2009 Acústic White which was still singing. It’s a testament to how well these wines age. After lunch we headed up into the hills to take a look at the different soils that made up the terroir of the property. We found huge fossilised clams and other sea creatures buried in the soil, terraces and rock faces. The nebulous description of ‘minerality’ makes much more sense once you have seen the terroir up close. At dinner we were joined by Albert’s lovely family and we feasted on ‘Calçot‘, an early winter vegetable that looks rather like a large spring onion. They are charred over wood and eaten with freshly made Romesco. It’s a messy affair but thoroughly enjoyable and incredibly tasty. Then came all the meat (sausage, lamb, black pudding, pork, chorizo), fried artichokes, more bread, cheese…it was a feast! Albert generously opened a bottle of 1999 Mas Vilella which completely stole the show. The next day we headed off to Montsant about 60km away. This is where it all began for Albert so I was very excited to see the vineyards that put him on the map. His sites are spread like a patchwork all over the region so we visited a few of Albert’s favourite parcels as well as some new plots he is working. There is no glamorous tasting room out here; just two barrels and a great view of the vines. 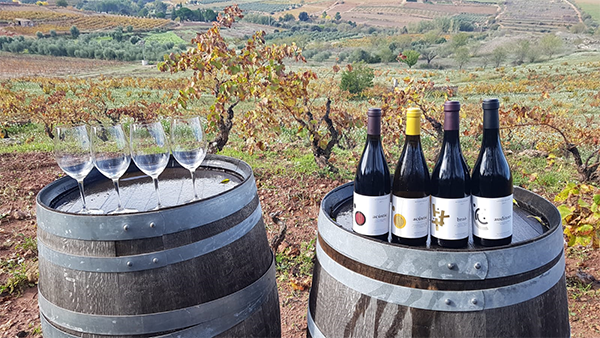 We tasted through all the new vintages – 2016 for the Acústic White & Acústic Red, 2015 for the Brao & Auditori both of which will arrive in the UK next year. These were all delightful, beautifully balanced and a joy to drink. The Acústics are ready to go but will keep well for at least 10 years. The Brao and Auditori were delicious but would benefit from time in the cellar and will keep for at least 15-20 years. Albert is a joy to be around. He’s an extremely humble man, a true gent and of course a brilliant winemaker. His passion for nature, viticulture and oenology is infectious. He often says that the essence of good winemaking is to let the vines do all the work. “…95% in the vineyard, 5% in the winery”. This minimal intervention approach has been employed since Acústic’s inception in 2003, where organics & biodynamics are common practices. He will be officially certified from the 2017 vintage onwards. It was a great privilege to visit these vineyards, taste these outstanding wines, and get a better understanding of Albert’s vision for the estate. A truly unforgettable trip! Thank you Albert.